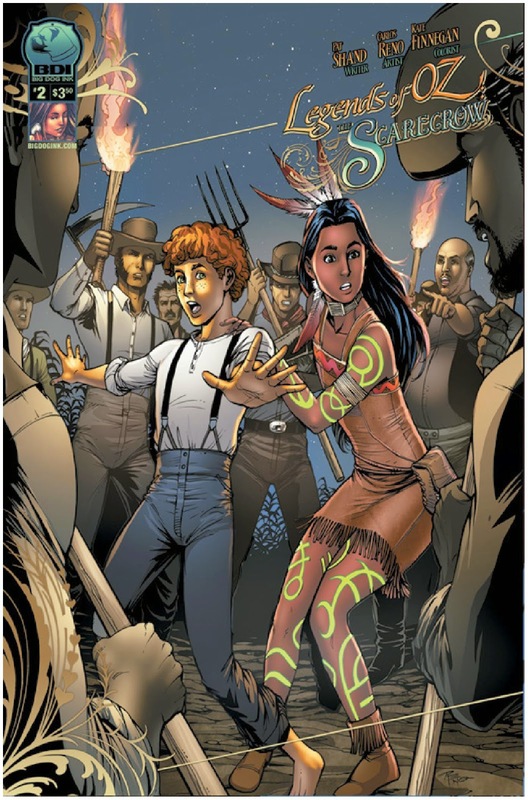 The Fellowship was fortunate enough to obtain a copy of LEGENDS OF OZ: THE SCARECROW #2 from Big Dog Ink Comics. The story is by Pat Shand, with art by Carlos Reno, colors by Kate Finnegan, and lettering by HDE. The newly freed folks of Denslow want to get revenge by destroying all scarecrows…including our heroine. The evil scarecrow was using parts the townsfolk to make himself human. It took the intervention of the sheriff’s son Lyle for them to realize that Scarecrow is on their side and the other scarecrows are being used by their captor. Can the townsfolk put aside their prejudice and deal with the real threat, or will things get even worse than they have? Is it even too late for that? This is the concluding chapter of a prequel to the LEGENDS OF OZ miniseries. Pat Shand (ROBYN HOOD) jumps in and does a great job of fleshing out the Scarecrow character. Carlos Reno’s ability to have her communicate to everyone (including the reader) without the power of speech is great. Overall, his art is very nice. LEGENDS OF OZ: THE SCARECROW #2 is stores now or available for ordering at www.Bigdogink.com.